As it looks for new methods of monetization, the Associated Press today announced that Samsung will be the first company to provide sponsored tweets to the news agency's primary Twitter account, found at Twitter.com/AP. The social media sponsorship is set to coincide with the 2013 Consumer Electronics Show in Las Vegas starting today and the advertising will appear twice a day this week (Jan. 7-11). 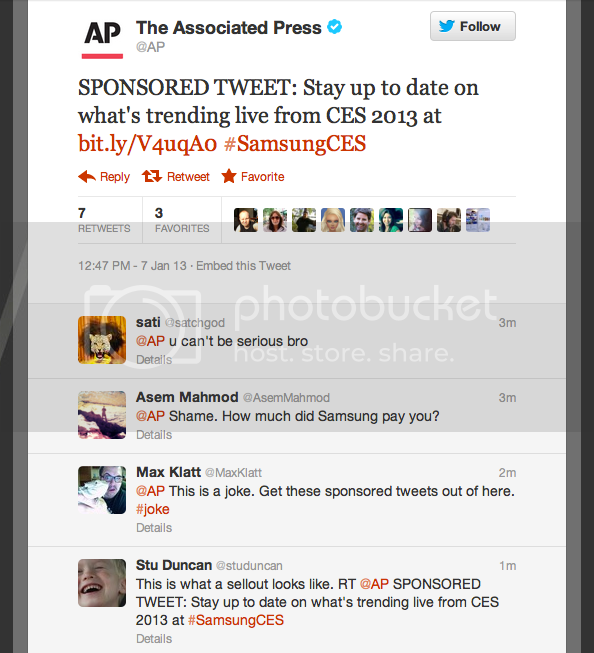 The effort builds on AP's expansion into new advertising for mobile and social media. The AP's flagship Twitter account has more than 1.5 million followers. The tweets will be labeled "SPONSORED TWEETS" and the content for those tweets will be provided by Samsung and handled by staff outside the AP newsroom. The AP developed internal guidelines in recent months so that it may build new business models in the new media landscape without compromising its newsroom values and principles. "We are thrilled to be taking this next step in social media," said Lou Ferrara, the AP managing editor overseeing the newsroom social media efforts. "As an industry, we must be looking for new ways to develop revenues while providing good experiences for advertisers and consumers. At the same time, advertisers and audiences expect AP to do that without compromising its core mission of breaking news."